Main Compartment: The single large main compartment has a removable waterproof liner and a top that rolls down and is clipped in place. This pack is about as waterproof as a rucksack can get and works very well. It makes getting at items in and out of the pack slightly involved - but keeping all you important spare clothed and food dry is compensation enough. Pockets: Two external pockets - one on the top and one on the back. Neither pocket is waterproof but both have good storm flaps. I felt both pockets were a bit small. There is also a mesh pocket on the back. Hip Belt: Wide and padded at rear, thin and unpadded at front. Remained comfortable throughout test. Shoulder Straps: Quite thick and well padded. Remained comfortable throughout test. Load Compression: Achieved by pulling a cord on the back of the pack. Crude but quite effective. Tends to work loose on a long day. Back System: Flexible internal man-made material with fixed metal strip bends to back shape when pack is worn. Combined with good padding, this system remained comfortable throughout the test. Pack is adjustable to match body length. 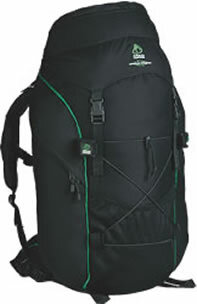 Has a webbing section that keeps the pack away from your back and allows air to circulate between you back and the pack. This works very well and helped keep my back drier than usual. Fit: Well padded and shaped to provide good degree of ventilation and comfort. Very comfortable. Material: 600 Denier texturised polyester. Waterproof Cover: No. Pack is Waterproof. Other Features: Employs Craghoppers' own 'Dynamic Balance' system to 'even-up' uneven loads - like carrying skis or and ice axe on one side of the pack. Well padded and very comfortable, the Craghoppers CHT550 Dri-Pac is one of the best backpacks I've tried. The waterproof system makes getting things in and out a little involved - but this sure beats getting them wet!